Most golf courses have rules about men's golf apparel. You will know the golf dress code at your local golf club but you should never assume it to be accepted everywhere. You should always check the golf dress code in advance when playing on an unfamiliar golf course, which is often the case when going on a golf vacation. Golf courses do turn away golfers that do not meet the clubs dress code. You can usually buy the appropriate golf clothes at the pro shop at the club premises but expect to pay premium price for it. The golf dress code varies between golf clubs. You can usually assume that the more expensive the golf course is, the stricter the dress code is likely to be. The dress code can also vary between countries and different cultures. Smart and conservative look is always the safest choice when playing golf. In general, a collared shirt and tailored shorts or pants will get you onto most golf courses (around 95% of them). It is always sensible to wear recognized golfing clothing and golf accessories when playing on an unfamiliar golf course. Many golf clubs do not allow clothing designed for recreational activities or other sports than golf, e.g. football, athletic and beach clothes. Short sleeve shirts with collar are the most popular and appropriate men's golf shirts when playing in warm climate. Neutral colors tend to be the best choice when playing on unfamiliar golf course. However if you want more colorful attire then it is good idea to choose one bright color and pair it with neutral colors. If you are playing in cooler climate or during cooler times of the day / year, then consider dressing in layers. Pack long sleeve shirts, golf sweater and / or vest, as well as jacket or golf rain gear. As always, it is safest to bring along recognized golfing clothing, as not any old sweater will do. Majority of golf courses allow shorts, especially those in warm climate. They will have to be golf shorts though, gym or sport shorts are not acceptable. 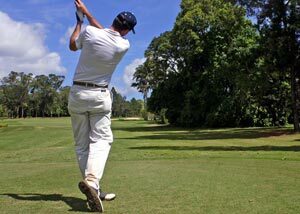 Golf shorts are flat front / Dockers-style shorts and can be worn with a belt. Long pants are though always the safest bet when playing on unfamiliar golf course. Not any pants will do though, e.g. denim / jeans are usually not accepted. Long pants are usually worn with a belt. When travelling for golf look for lightweight pants or shorts. It is actually good idea to bring one long lightweight pants along just in case. If you do not use them on the golf course you can use them when sightseeing or when going out to casual dinner in the evening. Thin fitting pants or shorts that do not cling to your legs are the most comfortable. Pockets big enough for couple of tees and an extra ball are also good idea. Neutral colors like navy, blue, khaki and white tend to be most popular. Good golf shoes are must for any golfer, as you will be walking on average 3 - 4 miles on an 18-hole golf course. There are cheap golf shoes available but most golfers consider quality golf shoes as an investment that they do not want to skimp on and buy the best pair they can afford. You will need golf shoes with soft spikes since almost all golf courses now ban metal spikes as they damage the greens. You can replace the metal spikes with soft spikes. You can do it yourself or check with your local pro shop, they are likely to be able to do it for a small fee. Always arrive in street shoes and change into your golf shoes in the locker room. Wear your street shoes off the golf course, e.g. if you are having lunch or drink in the clubhouse after your round of golf. Most people prefer warm climate destination for their golf vacation, or at least at the warmest time of the year. Many golf clubs in warm climate allow golf sandals instead of golf shoes but do check in advance, if you have not played there before. Golf sandals have similar / same type of sole as golf shoes but offer open toe and foot for breathability and you can wear them without wearing socks. If you are playing golf in cold or messy weather then golf boots is a good option. They have the same soles with spikes as golf shoes, but offer better protection and are made of material like Goretex, designed to keep out the cold and wet. Most golfers prefer wearing socks that match the trousers when wearing long trousers but white socks with light colored shoes and black socks with dark colored shoes when wearing shorts or skirts / skorts. However, some clubs insist on knee length or white ankle socks to be worn with all shorts. If you are travelling and playing golf in destination with colder climate then you will need to pack some golf outerwear as well. As always, it is recommended to think layers and lightweight when choosing which items to bring along. You can get lightweight golf jackets and pants that you can wear as your main outfit or over your normal golf gear. Getting soaked is never fun (when playing golf) so it is good idea to bring some kind of a golf rain gear whatever the climate. You will need more than just golf apparel when travelling for golf. There are many golf accessories available for men, most of them very useful and aimed to improve your game. Hats protect your head from the sun but they also provide valuable shade for your eyes. Hats are also ideal in cold climate to keep your head warm and dry on rainy day. There is good selection of hats available but baseball hats tend to be the most popular choice. Visors are also popular choice by those that do not like wearing hats. Good sunglasses are valuable aid on the golf course, they protect your eyes from the sun and improve your vision on sunny days. Nice looking belt will give your men's golf apparel more stylish and polished look. Golf glove is also highly recommended golf accessory. Golf glove gives you more secure grip, not least when the grips are wet or you are sweating. Most golfers wear only one glove, i.e. on the lead hand. Wearing one glove and playing golf frequently can result in visible color variation between your hands. You might want to wear two gloves or use high level of sun block on your gloveless hand. Golfsmith offers excellent quality Men's Golf Apparel at very competitive prices. They are so confident about their prices that they offer 115% Low Price Guarantee, i.e. they match 100% the published price on a stocked item plus an additional 15% of the difference from the competing web site on any identical in-stock item. We recommend reading their customer reviews and check their men's apparel sizing chart prior to purchasing your men's golf apparel. Do not forget to check their Golf Outlet as you can save 10 - 70% on various quality golf products. Not only golf apparel but also on golf clubs and golf club travel bags, i.e. everything a golfer needs home or away. Amazon also offers wide range of mens golf apparel.